Tubbataha Reef in the Philippines continues to entrance marine tourism lovers as well as the seasoned local and foreign travelers -- aptly named Jewel of Palawan. Derived from two Samal words meaning “long reef” exposed at a low tide, it is the largest coral reef and first natural World Heritage Site of the country. Tubbataha Reef has been included in the search for the “7 Wonders of Nature in the World.” In fact, Tubbataha garnered one of the slots. 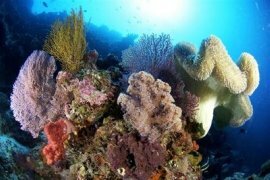 It covers some 33,200-hectare community of diverse corals, fishes and other forms of aquatic life. It is a dream destination for divers and marine scientists. It is home to more than 300 coral species, at least eight species of marine mammals, 380 species of fish, seven species of sea grass and 71 species of marine algae. The Tubbataha Reef and surrounding waters have been declared a National Marine Park under Proclamation No. 306 in August 1998. Five years later, the United Nations Educational, Scientific and Cultural Organization (UNESCO) designated the reef as a World Heritage Site. Because of its rich and diverse underwater world, Tubbataha is a must-see destination for serious divers, even if getting there entails virtually living on a boat for a few days and for a steep fee. Tubbataha-Sulu liveaboard scuba diving trips cost between P30,000 and P40,000 depending on the boat and length of stay. The north and south reefs of Tubbataha have the biggest concentration of fish in the country. The landmark of the South Tubbataha is the solar-powered lighthouse that stands on a tree-covered islet. To the east of the lighthouse is the steel remains of the Delsan wreck, sitting atop the reef. There are also sandy clays that extend five kilometers in length and three kilometers in width. It is separated from the north reef by an eight-kilometer channel. Everything in Tubbataha is huge. Jack and trevallies, groupers, triggerfish, Napoleon Wrasse, turtles, even the lionfish and sharks are all bigger than those seen in other diving sites. The fish also often move in shoals, meaning hundreds and even thousands, making them appear like one large animal to protect them from bigger predators like sharks. The WOW Philippines commercial on CNN and BBC (some years ago) features a school of small orange fish swimming diagonally atop a coral with the caption “more than the usual rush hour.” That’s a common routine in Tubbataha. On a good day, one can see as far as 40 meters under water. The average water temperature is also warm enough for diving at 27.9 degrees Centigrade. The north coral atoll is bigger than the south reef, extending 16 kilometers in length and three kilometers in width. It has a sandy slope, which drops after 15 meters to a wall with caves and crevices where sharks and lobsters like to sleep. The coral garden in the north reef, at just 25 feet, is colorful and teeming with fish. The coral formation is like a sculpture; some corals tower as high as three feet, which is unusual since corals only grow between one and 10 centimeters every year. North Tubbataha is an easy, worry-free dive –- no strong currents, good visibility, and no technical problems. Its twin atolls form the epicenter of marine life that also serves as a fish nursery for the greater Sulu Sea and the surrounding islands. Tubbataha thus contributes significantly to the country’s food security. Tourism wise, the reef’s value increases yearly in terms of contributions to the national and local economy. As a World Heritage site, it is valued by people who know that they exist and are being maintained for the employment of present and future generations. The preservation of this biodiversity, which compares favorably with the richest and most abundant marine areas in the tropical world, contributes immensely to the long-term maintenance of the marine species and their genetic diversity in this part of the world. Despite the reef’s remoteness, its amazing underwater gardens and diverse wildlife have not been spared from destruction. Illegal fishing using dynamite, sodium cyanide and other environment-unfriendly methods became rampant in the 1980s, but were brought under control with the presence of the Philippine Navy. In July 1995, the then Ramos administration created the task force for the Tubbataha Reef National Marine Park, which developed action plans to reverse environmental degradation in the area and started sustained patrol operations. For the past years, the Philippine Navy and World Wide Fund for Nature (WWF)-Philippines have been working hand in hand to patrol the area against illegal activities. Rangers are assigned to protect the area as well as to help tourists and divers who visit the reef. Together with the province of Palawan, the Palawan Council for Sustainable Development, and other local non-government organizations, WWF-Philippines continues to campaign for the park’s protection. The Department of Environment and Natural Resources (DENR) and the UN Development Program have signed an agreement for a four-year, medium-sized project grant amounting to US$ 750,000 to continue conservation activities in Tubbataha.